Mama Cloth – What Is It? Mama cloth… Menstrual cups… I had been menstruating 13 years before I heard about reusable menstrual products. When you get ‘the talk’ you’re told about pads and tampons. That’s it. No one mentions an entire line of reusable products that are more comfortable, eco-friendly, and economical. The first time someone told me about mama cloth, they didn’t do it in a very positive way. And I was instantly turned off. No way was I going to reuse a pad, even if you did wash it. Actually, no way did I want to wash something with blood all over it. That was gross right? WRONG! My curiosity about cloth pads got the better of me and I decided to do more research. Turns out there were a lot of options out there. Users of mama cloth swore that they were comfortable. Users of reusable cups said they barely noticed their periods at all. I was intrigued. My foray into mama cloth happened while I was pregnant with my second child. Pregnant women know the insane amount of liners you can go through. I sewed up a few pads with adjustable absorbency and I loved them! They were far more comfortable than their plastic backed disposable counterparts. And they were much more breathable. I have continued to use mama cloth since, almost two years ago. 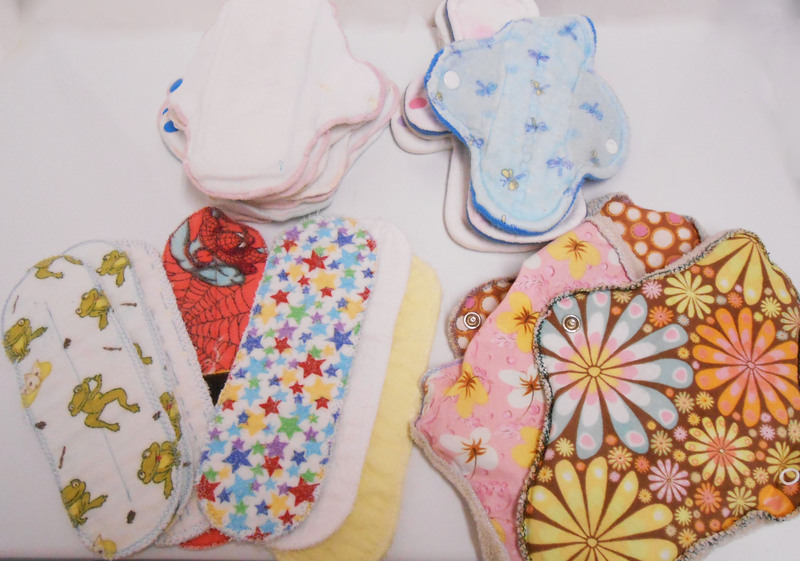 Cloth pads come in a variety of shapes/lengths/widths just like disposable pads. If you sew your own, or find a WAHM willing to do a completely custom pad, your options are truly endless. 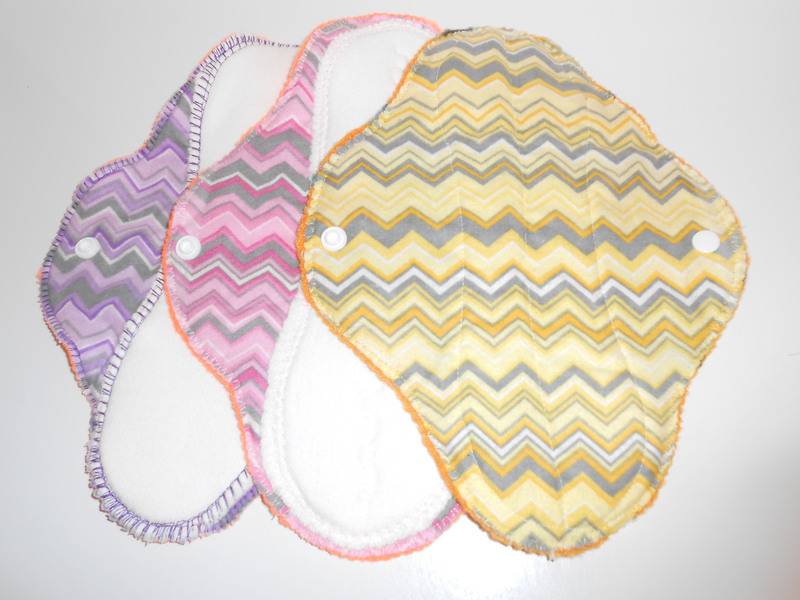 Cloth pads come in a variety of absorbencies just like disposable pads. Liners, light flow, medium flow, heavy flow, postpartum, overnight, etc. It’s all out there ready to purchase. There are also pads with adjustable absorbency which is something you won’t get with disposable products. These pads have a body (or shell) that you slip your absorbent core into. So you can add more layers as needed. If you are prone to rashes or chaffing with disposable pads, that will likely go away with cloth pads. Cloth pads don’t contain chemicals like their disposable counterparts and they are breathable. Pads backed with fleece or wool and containing no PUL are especially breathable. Any type of heat rash and chafing I had with disposable pads completely disappeared with cloth. I don’t get that sore feeling after wearing them that I did with disposable pads. Since cloth pads have no chemicals, they can also reduce your flow and cramping. I’m no doctor, but I have talked to many women who use cloth pads and/or menstrual cups. And most of them say that they’re flow, cramps, or both decreased after switching to reusable menstrual products. The simple explanation is that there are no chemicals in the reusable products while there are in the disposable counterparts. The chemicals can be an irritant to many women and your body needs to flush these chemicals out of your body – thus a heavier flow and more cramping. When you’re out, you can store dirty pads in a waterproof makeup bag. Most cloth pad retailers also sell small wet/dry bags designed to hold dirty pads and clean pads in separate pockets. Cloth pads are pretty easy to care for. And if you do it properly, they will last YEARS, saving you a lot of money. So how do you care for them? If you cloth diaper, you can rinse your pads in cold water and throw them in your dirty diaper pail. Rinsing them actually isn’t even necessary, but it does help prevent staining. If you don’t have cloth diapers to wash, you can get a small wet bag, or one of those tiny trash cans that you often see at ice cream parlors for sample spoons. These trash cans are sold at the Dollar Tree and many other retailers. Again, rinse in cold water to help prevent staining, and throw them in the pail. Store your dirty pads here until the end of your cycle or whenever you are ready to wash. I wash mama cloth every other day with my dirty diapers. Before you wash, rinse them again in cold water (Some prefer an overnight soak with a bit of vinegar and cold water. Just note that vinegar CAN break down PUL if you use a pad backed with PUL). Throw them in the washer on their own OR with regular laundry. Just don’t use fabric softener when washing mama cloth as it can cause repelling and greatly diminish the pad’s absorbency. Hang dry, or throw them in the dryer. What about staining? Some materials are more prone to staining than others. Pads topped with microfleece, suedecloth, and minky are actually rather hard to stain. Natural fibers like cotton, hemp, and bamboo stain more easily. Rinsing with cold water before placing in your pail or wet bag helps reduce staining. If your pads do stain, soaking in oxi-clean or sunning them with lemon juice can help remove the stains. And remember, a stain DOES NOT mean that something is dirty. An added bonus? Cloth pads come in lots of pretty colors and prints. *Disclosure: Please note that some of the links provided are affiliate links. Definitely! Cloth pads are for all women. Young and old. I know they were a life saver for those early pregnancy and post-pregnancy sneezes too! why have I not heard of these mama cloths before? Cool! Happy to help! I’m sure you’ll love mama cloth, it seriously made that time of the month so much better for me. And they’re so quick and easy to make. Thank you so much for the pattern! I made my first pad yesterday and it was so simple (excluding my crappy machine that makes my sewing look horrible!). I love the felt breakfast items as well! !